When thinking about lighting your home, there is so much more to light than downlights, which is often the ‘go-to’ solution, but certainly not the most ideal choice for creating a warm and inviting environment in your home. Lighting affects your mood in so many different ways, so having multiple options means you are able to adjust the lighting to reflect your requirements at any time. This also means ‘future proofing’ your lighting so that it meets your requirements now, but also when the use of a particular room changes, or the functionality within a room is varied. This means that as your family requirements change, your lighting is adaptable to cope with any changes. Unfortunately though, downlights are often installed as an easy option, however they create shadow, and deliver a lot of glare, which doesn’t induce a relaxed feeling in a room. This is not to say good quality downlights cannot be used with other light sources. There are three key aspects to think about when creating flexible and adequate lighting options for your home. These are; ambient or mood lighting, task lighting and decorative lighting. Task lighting is exactly that – it allows you to perform a task, such as preparing meals in the kitchen, or applying make-up in the bathroom. It needs to provide a good source of light, without shadowing, so you can get on with the job at hand. Up lights, wall washes, directions spot lights and strip lights are all good sources of task lighting. Decorative lighting is generally achieved with pendants or lamps, and often forms part of the interior design. They not only look wonderful in a room, but also create mood and ambient lighting at the same time. Lamps are particularly useful as they can be moved around with some lamps also doubling up as directional task lighting, such as desk lamps. A good example of working with multiple light sources and ‘future proofing’ your lighting design, is over a dining table. 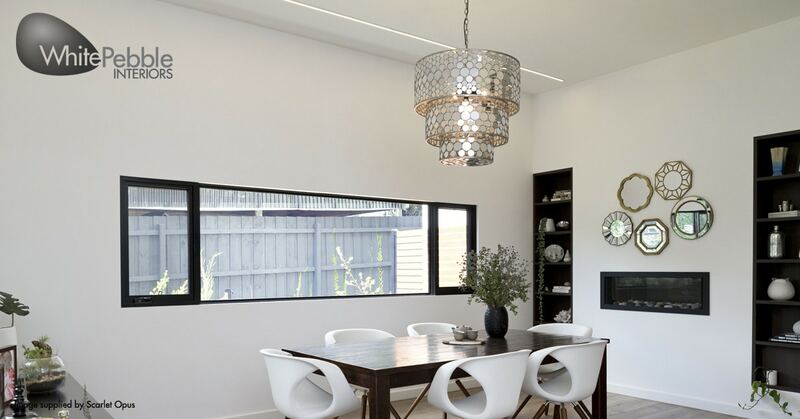 Many people opt to have a decorative pendant light over the dining table to create a lovely aesthetic, as well as being able to adjust the light up or down when entertaining, with the use of a dimmer. At some point though, it’s almost inevitable that your children will end up studying at the dining table, and a decorative pendant is not likely to provide enough light for doing homework. An additional light source would be required to provide sufficient light for tasks such as homework, or other activities such as bookkeeping, craft or board games. An up-light, wall wash, or strip light could be installed so that the dining table has lighting set up for tasks, as well as creating a lovely ambience while eating. When it comes to lighting, the key is to create flexibility through multiple light sources that give you choices on how you want a room to be or feel. Planning for changes in family requirements also means your lighting is suitable for many different scenarios, and that’s future proofing at its best!